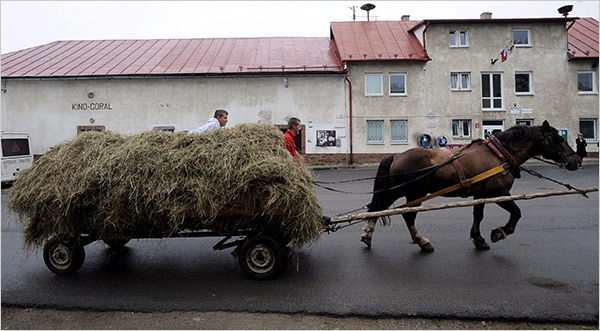 A number of people forwarded me the most recent New York Times article on Slovakia while I was on vacation, and I found it problematic enough to think about breaking silence and writing something, if only to comment on the lovely horse-drawn wagon, apparently the mascot of all journalists visiting Slovakia. I didn’t but fortunately Scott Brown did, with his usual humor and sense of perspective. The thing I found most surprising about the article was not the tired “rural” image, but the fact that anybody bothers to write about Slovak-Czech rivalry. When I read the headline, “Neighbor’s Shadow Still Large in Slovakia” I assumed it was about Hungary, a neighbor that actually does cast a shadow on political debate in Slovakia on a daily basis. Articles like this create for me a big problem: having seen how a good newspaper’s coverage of a country I occasionally visit contains basic errors of interpretation and asks the wrong questions, what can I make of that same paper’s coverage of countries I know nothing about? Is the stuff on Indonesia and Ghana just as limited? I hope not but I fear so. “Less than perfect” could be the title of nearly post on polling coverage in Slovakia (hence, in many ways, this blog), and I shouldn’t be too critical but today both major papers went out of their way to mangle polling data. In SME: “New party Most already clearly drawing Csaky voters” cites a Polis poll showing SMK at 5.7%. Not only does the paper fail to assess whether Polis does good polls (they use telephone surveys which are problematic and they haven’t released a party poll for a long time so we just don’t know for sure–but more on that in a later post) but it suggests a trend–and a causal relationship even–on the basis of one data point. We simply don’t know how SMK polled in previous Polis polls this year because there haven’t been any (at least I haven’t seen any and the paper certainly doesn’t provide them, using the 2006 elections as a frame of reference, as if that told us about polling trends). Other polls did show SMK higher in previous months, but all polls do not sample populations the same way, and even UVVM had trouble with even samples of the Hungarian population (http://www.pozorblog.com/?p=110), and showed a result for SMK as low as 6.7% in September of 2008. I’m not saying that Most-Hid is not pulling away SMK voters–in fact I suspect it is–but there’s no way of knowing it from the information we’ve got here. In some ways worse, both SME and Pravda use the same data set to talk about the woes of HZDS. SME simply makes the same mistake as above, suggesting that “HZDS continues to decline” on the basis of only the one Polis poll, without attending to the fact that different polls show different levels for parties and ignoring the fact that this month’s FOCUS poll show’s HZDS rising by more than a point, from 4.2 to 5.3. Pravda’s story, “Meciar not bothered by polls“ does something rather worse, citing not only the Polis poll but also the numbers from FOCUS for April (4.8) and May (4.2) without feeling obliged to report the big increase reported in June. It is clear to me that HZDS is in trouble, (and these microtrends usually don’t add up to anything, so I wouldn’t argue that HZDS support is actually increasing), but citing the first two numbers of a sequence of three seems a bit beyond the pale when the third number tells the opposite story.